Iowa is one of the most gambling-friendly states in America, yet there’s still some question about legal Iowa sports betting. Unfortunately, there are no physical sportsbooks opened in Iowa. Even though that is the case, that does not mean there is no way to get into legal Iowa sports betting. The best way to get into sports betting in Iowa is by going online to an offshore website. Until new laws are passed, going to an offshore website is your only option for sports betting in Iowa. Going through and understanding what all of these laws means can be a complicated process, but we are here to help. This page aims to inform you about what options you currently have in regards to legal sports betting and how things can potentially change in the future. We will also offer insight on where you can bet and what the future of sports betting in Iowa could look like. By the end of reading this guide, you will be much more informed about what legal Iowa sports betting. Is Land-Based Sports Betting Legal In Iowa? Although the laws above are in place, the legality of sports gambling is spreading across the US. Although sports gambling is not currently legal in Iowa, a bill has been brought to the state legislature, bill IA H 2448. The bill adds sports gambling into the laws that mention gambling and if the bill passes, it would make sports gambling in Iowa legal. Until then, there are still ways for Iowa residents to enjoy sports gambling in their state. Going to an offshore online sportsbook that we recommend is the best way for you to enjoy legal Iowa sports betting. Yes. Now, from a legally strict standpoint, one could make the argument that Iowa Code §725.7 forbids all forms of gambling altogether. This part of the law plainly says that “a person shall not…[p]articipate in a game for any sum of money or other property of any value,” nor can anyone even “make any bet.” That’s pretty broad. But it’s also completely unenforceable. Any law that inherently relies on selective enforcement as a matter in itself, unlawful. To that latter point, even though hundreds of thousands of Iowa residents bet on sports every day, nobody has ever been arrested, charged, or prosecuted for placing a sports bet in Iowa. The state will go after sports bookies and other unlicensed gambling vendors, but as long as you limit your part to simply placing sports bets, you’re almost certainly not going to get into any legal trouble. But what about the Unlawful Internet Gambling Enforcement Act? Its name kind of implies that Internet gambling is unlawful, doesn’t it? This is toothless. All the UIGEA does is penalize banks and other financial institutions for processing or transferring payments knowingly spent or earned via online sports betting. All the law really does is make payouts take a few days longer than they used to. If you want to get in on some legal Iowa sports betting then all you need is a computer or mobile device, an Internet connection, a few dollars, and about five minutes. Just hop over to a legal online sportsbook like Bovada, SportsBetting, BetOnline, or 5Dimes. There you can set up a free user account, deposit your funds, and place your bets. That’s literally all there is to it. Even if Iowa’s casinos were allowed to offer sports betting to their customers, using these websites would still be easier, faster, and more convenient. Until bill IA H 2448 passes in the state legislature, the closest places to you that actually offers land-based sports betting is West Virginia, Mississippi, or New Mexico. But those states are hundreds of miles away and you probably aren’t keen to spend your entire betting bankroll on gas or airplane tickets to get out there. Luckily, you’ve got a much, much closer option. Just reach into your pocket, pull out your phone, and try Bovada, SportsBetting, BetOnline, or 5Dimes. You can sign up at as many of the above sites as you want. Since it’s free to do so, there is little risk on your part. The reward? By being a member at more than one legal online sportsbook, you will be able to shop around for the very best bets and lines on any given contest. This alone should afford you a substantial edge and could make you a considerable amount of money in the long run. On paper, Iowa gambling law is a seemingly impossible contradiction in terms. Its state laws (found in §725.7 of the Iowa Code) simultaneously ban “any bet” in all forms while carving out so many exceptions that Iowa’s become one of the most gambling-friendly states in the country. Iowa’s first horse track was opened in 1989, and its first casinos were legalized for operation on tribal lands in 1991. In the decades to follow, both tribal casinos and commercial casinos have prospered in the area, making Iowa one of the premier gambling destinations in the Midwest. Iowa also has a lottery, legal bingo, charity raffles, greyhound racing, and pari-mutuel/simulcast betting available throughout the state. Oddly, Daily Fantasy Sports is not yet a part of Iowa’s gambling milieu, but progress is being made on that front. Sports betting, the most popular type of gambling in America, is legal in Iowa, though there are a few rules and restrictions to be aware of before you start putting down your dollars on your favorite football team. Legal Iowa sports betting is not available at any land-based location, existing – for now – solely on the Internet at offshore sportsbooks. If you’re interested in what home teams you can bet on in Iowa, there’s good news and bad news. The good news is that there are several Division I NCAA teams to follow. The bad news is that there are no teams from any of the US’ major professional sports leagues operating in the state. If you are visiting Bovada, SportsBetting, BetOnline, and 5Dimes, you can bet on any Iowan team or any team your heart desires. Prairie Meadows is the only remaining horse track in Iowa. Situated in the city of Altoona, this “racino” offers pari-mutuel Thoroughbred and American Quarter Horse racing betting, simulcast horse and greyhound races, slot machines, and various casino-style table games. Although this is an option for bettors in Iowa, going to an online racebook is far more convenient than going to a physical location. If you go to an offshore site like BetOnline, you will be able to see racebooks from all over the country and make straight and exotic wagers as well. Online racebooks are the best way for you to enjoy horse racing in Iowa. Even though Iowa is otherwise liberal re gambling in general, Daily Fantasy Sports is currently considered illegal. While there has been no statement by the state attorney general to this effect, DFS operators have interpreted Iowa Code §725.7 as banning the practice outright. There is currently a bill known as IA HB 613 and this bill aims to regulate and legalize DFS in Iowa. Until this bill is passed, players in Iowa cannot enjoy DraftKings or FanDuel’s daily contest or win any of their cash prizes. With the progress Iowa has made to legalize sports betting and with its current laws regarding gambling, we are sure this bill will pass and DFS will be welcomed in the state. Can I Bet Real Money On Sports In Iowa? It’s the best thing to use. In fact, it’s the only thing to use. To do that, though, you’ve first got to deposit it into your sportsbook(s) of choice. Most books will offer several deposit options, and you should consider speed and security when making the best choice for your needs. Visa and Mastercard credit/debit deposits are the fastest methods (only Bovada takes American Express), though Bitcoin is also comparatively quick while offering a heightened level of data security. These methods will all take about a day to show up in your online sports betting account. More traditional deposit methods come with large fees and typically take a lot longer to process. If turnaround isn’t a huge priority, then money orders, wire transfers, and personal checks might be right for you. Is Online Sports Betting Safe In Iowa? If you do it online, legal Iowa sports betting is safe. Because Bovada and its main competitors all use state-of-the-art encryption and data security protocols, you can rest easy knowing that hackers and scammers will have a really difficult time getting into your account. To date, there’s never been any data breach of consequence among the big online sportsbooks, and these companies all have a vested interest in keeping your money safe and accessible on their end (it’s probably riskier buying LuLaRoe on Facebook). Will Sports Betting In Iowa Ever Be Legal? It’s almost a foregone conclusion that land-based legal Iowa sports betting is going to start being rolled out within the next few years. Most gambling is already part of Iowa’s overarching culture. If bill IA H 2448 passes in the state’s legislature, sports gambling will also be a part of that culture. 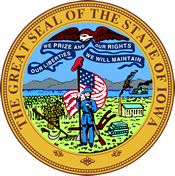 Will I Get Arrested For Sports Betting In Iowa? Almost certainly not. Internet sports bettors are not at much risk to be victimized by the government, and to date, there are no reports of anyone in Iowa ever being arrested for betting on sports with an online sportsbook. However, if you’re overly concerned about the (exceedingly slim) possibility, you can always bet using Bitcoin for greater anonymity and peace of mind. What Is the Sports Betting Age In Iowa? There is no explicit age minimum for legal Iowa sports betting, but it’s considered best practice to go with the area’s casino rules. In Iowa, most casinos require their customers to be 21 years of age or older to play, so that’s what you should probably stick to when betting on sports. Some Iowa tribal casinos have lowered their age limits to 18, which is in line with most online sportsbooks’ rules, but it’s still probably best to err on the side of caution and wait until you’re 21. Are There Mobile Sports Betting Apps Available In Iowa? To date, there are no official apps for Bovada et al. on Google Play or in the App Store. If you want to have a reasonably smooth mobile experience when enjoying legal Iowa sports betting, you still can. Bovada, SportsBetting, BetOnline, and 5Dimes have all developed mobile versions of their websites for this purpose. Just visit these sites on your smartphone or tablet, save the landing page to your device’s home screen, and use that as a so-called “web app” to access your betting account and wager options quickly and efficiently. Where Is The Best Place To Bet On Sports In Iowa? Since legal Iowa sports betting is only available online right now, the best place to bet on sports in Iowa is on a brand new on your mobile device. Of course, you can still use any modern smartphone, tablet, or computer for the task. If you’re only going to join a single online sportsbook, you should choose Bovada. It’s one of the old guards when it comes to online sports betting, and it has a remarkable reputation for always doing right by its customers. It’s also the easiest sportsbook to use, having the most straightforward layouts and bonuses. While signing up at multiple books is almost always preferable in the long run, Bovada is definitely where you want to start your legal Iowa sports betting adventure. Should I Use A Local Bookie In Iowa? Not even once. Remember, legal Iowa sports betting right now can only take place over the Internet, and then only with sportsbooks outside of US jurisdiction. A local bookie accepting bets within the state of Iowa would be knowingly violating several serious state laws and you could easily get caught up in that mess. And if you get caught and have to clean up that mess, your legal expenses will likely outweigh all of your combined winnings. Sports betting is about probabilities and odds, and taking such a big risk on a local bookie simply isn’t worth it. Save your money, enjoy your freedom, and bet at an online sportsbook instead. Do Any Casinos In Iowa Have Sports Betting? There are over 20 casinos in Iowa, and while they offer the gamut of the familiar card and table games, they do not offer sports betting. Once bill IA H 2448 passes in the state legislature, this will surely change but for now, you can only take part in legal Iowa sports betting by signing up at an online sportsbook. That said, I suppose you could take your phone into an Iowa casino and bet on sports at Bovada et al. while you hit the slots and the blackjack table. Does that count? Can I Bet On Sports With My Friends In Iowa? According to Iowa Code §99B.45, social gaming between individuals is allowed. This includes sports betting and various other “[g]ames of skill and games of chance, except casino-style games other than poker.” There is one caveat to consider, though, and that’s the fact that Iowa has placed a $200 limit on the amount any private person can win from any other(s) over a single 24-hour period. This seems impossible to enforce, but just know that if you win $300 off some sourpuss by picking the Packers over the Vikings, he can go to the police and get them to make you give him back his money. Betting with losers is fun. Betting with sore losers, not so much.